A small selection of first-class office spaces of various size is available to let at flexible rental terms in this impressive building. 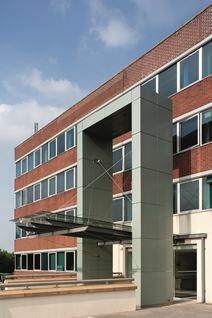 The building is strategically located along one of the most important roads which offers direct connections to Manchester city and Manchester Airport and is close to the underground station and to the motorway network. This business centre occupies a prominent position on a main arterial route in and out of the city. Refurbished to a very high standard, this centre offers nearly 20,000 sq ft of quality space across three floors. Nearby amenities include TGI Fridays and several supermarkets. There is a metro stop (Dane Road) located just a few minutes away, and from there Manchester City Centre is just 15-minutes away. This property is within easy reach of the M60 the M56 motorways, and Manchester city centre is just a 15-minute drive away. This modern building has a prominent position and offers an impressive business environment. 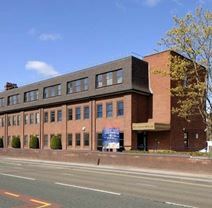 Located six miles south west of the city centre of Manchester this self-contained building is set over three attractive floors of office accommodation that benefits from on-site parking at a ratio of 1:190 sq. ft. Within walking distance of Sale Water Park and Dane Road Metrolink stations allowing for quick travel into the centre of the city. Located in Sale, this centre gives tenants lots of control over how they wish their space to be designed, allowing for you to build your office to fit the identity of your brand. 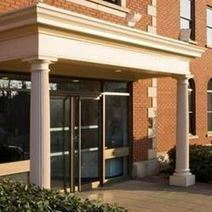 Amenities include 24 hour access, onsite car parking, cycle storage and meeting room facilities. Sale itself is just a few miles south of Manchester and tenants will find excellent transport links into the city, with Sale Metrolink just a ten minute walk from the centre. Conveniently located in a dynamic and popular area of Manchester, this modern three floor building offers a selection of offices on the 2nd floor. Available at flexible rental terms, these offices can accommodate any of your needs. They are equipped with central heating systems, lift, new carpet and a number of other facilities to offer a professional working environment. The building is close to the motorway and to the railway station. 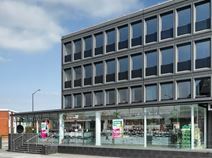 Conveniently located in a prestigious area of Manchester and surrounded by numerous amenities, this modern building offers a selection of office spaces of various size. Furnished to a high standard and sophisticatedly decorated, these offices offer a very professional working environment and are available at flexible rental terms and at a very convenient all-inclusive price. The building is well connected to the motorway and served by public transport.